Background: RNase P-mediated cleavage of target RNAs has been proposed as a promising tool for gene silencing. Ets-2 proto-oncogene controls the expression of a wide variety of genes involved in cancer and immunity. 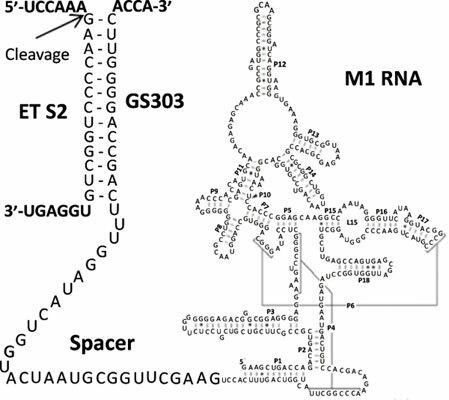 Objective: Construction of a functional RNase P-based ribozyme (M1GS303) that targets Ets-2 mRNA. Methods: The accessible sites for targeting of Ets-2 mRNA were identified by footprinting analysis. M1GS303 ribozyme was constructed by cloning. The activity of the ribozyme in the presence or absence of spiramysin in E. coli cells and human cell lines was quantified by RT-PCR. The efficiency of the ribozyme in silencing the endogenous expression of Ets-2 in human cell lines was examined by RT-PCR, western blot and immunofluorescence analysis. Results: In E. coli cells co-transformed with plasmids bearing M1GS303 and the ets-2 target gene, Ets-2 mRNA was decreased by 93% 12h after IPTG induction in the absence, and after 4h in the presence of spiramycin. Ets-2 was rapidly downregulated in the human embryonic kidney cell line HEK293 and the T-cell line Jurkat transfected with an M1GS303 plasmid; the silencing effect of M1GS303 was considerably faster when the cells were cultured with spiramycin. In Jurkat cells, Ets-2-downregulation resulted in upregulation of the expression of IL-2, IL-4 and IFN-α cytokine genes that have Ets-2 binding sites on their promoters, whereas it had no effect on the expression of the IL-10 gene that lacks Ets-2 binding sites on its promoter. Conclusions: M1GS303 ribozyme cleaves effectively Ets-2 mRNA in bacteria and mammalian cells, and its activity is enhanced by spiramycin. Downregulation of ets-2 gene in the T-cell line Jurkat upregulates IL-2, IL-4 and IFN-α cytokine genes. M1GS technology may be a better alternative to conventional gene-interference therapies and the delineation of the effects of gene silencing in various pathologies. Keywords: RNase P, spiramycin, gene silencing, cytokines, IFN-α, IL-2, IL-4, IL-10. Keywords:RNase P, spiramycin, gene silencing, cytokines, IFN-α, IL-2, IL-4, IL-10. Abstract:Background: RNase P-mediated cleavage of target RNAs has been proposed as a promising tool for gene silencing. Ets-2 proto-oncogene controls the expression of a wide variety of genes involved in cancer and immunity. Potassium Channel Openers and Improvement of Toxic Stress: Do they have Role in the Management of Inflammatory Bowel Disease?